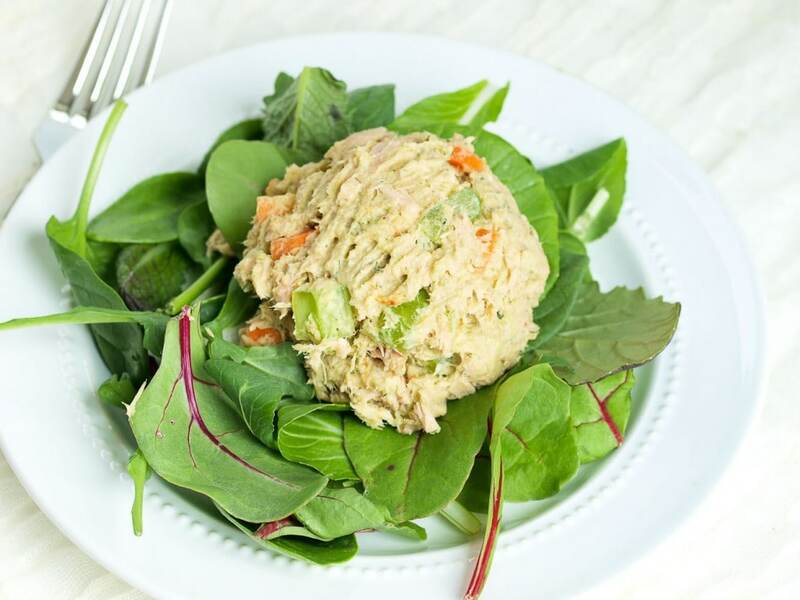 Are you looking for a healthy tuna salad? This Avocado Tuna Salad is a healthy tuna salad without mayo! It makes a healthy, easy lunch! This Avocado Tuna Salad is the healthy tuna salad I’ve been turning to for quick lunches for years now. I love that it takes about 5 minutes to make and I get a balanced, delicious meal that’s loaded with nutrients. Do you know if you’re getting enough omega 3 fatty acids? For me, the omega 3s available in plant foods, ALA, are much easier to get in my diet than the ones found primarily in some fish, EPA and DHA. Unfortunately, the ones that are harder for me to get are the ones I need more. 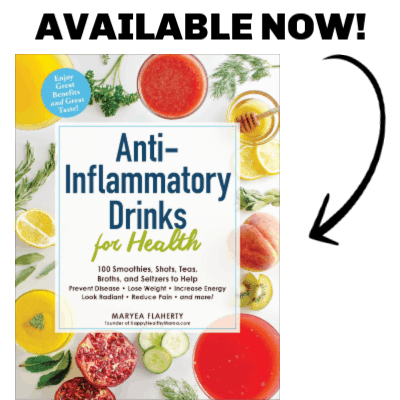 EPA helps control inflammation, DHA is vital for our nervous system, including brain function (and development in children), and both are important for our heart health. These omega 3 fatty acids are probably one of the most important nutrients we can feed our bodies, yet many of us aren’t getting enough. 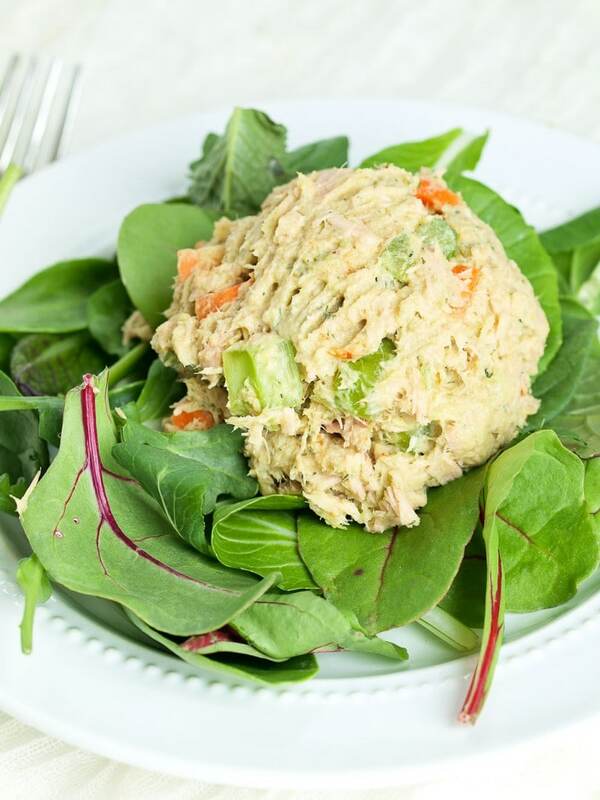 Healthy tuna salad is loaded with omega 3 fatty acids! I’ve been turning to this Avocado Tuna Salad for one way to help me get those essential fatty acids into my body. What Can I add to Tuna Instead of Mayo? Avocado is the natural answer! It’s not that I don’t like mayo. I like it a lot, actually. It’s just difficult to find a mayonnaise with healthy oil. Most have soybean oil, which I mostly avoid, and even the healthier varieties are made with canola oil, another one I prefer to limit. There are some made with avocado oil now, but they are more expensive. Sure, I could make my own mayonnaise, but who has time for that? Not this mama. Avocado is a perfect stand-in for mayonnaise in this recipe. I add carrots and celery for crunch and extra veggie goodness. For a different twist, I also add just a touch of smoked paprika. I love the flavor of it and it makes this avocado tuna salad a little different than traditional tuna salad. You can definitely leave it out if you don’t have any or don’t love the smoky flavor of it. I use Wild Planet Wild Albacore Tuna, which is only cooked once (many tuna brands are cooked twice which diminishes their nutritional content) and is packed without oil, water, or fillers. According to their website, this tuna is not only rich in omega 3s but also has lower mercury content due to the smaller size of fish they catch. I highly recommend this brand. I find this brand at Costco or you can get it on Amazon. I think this salad is perfect on top a bed of lettuce. It’s a filling, yet light lunch. I hope you love it, too! This Healthy Tuna Salad without mayo is made with avocado! It’s quick and easy to make and super flavorful! In a medium bowl, mash together the tuna and avocado. Serve as a sandwich or over a bed of lettuce. 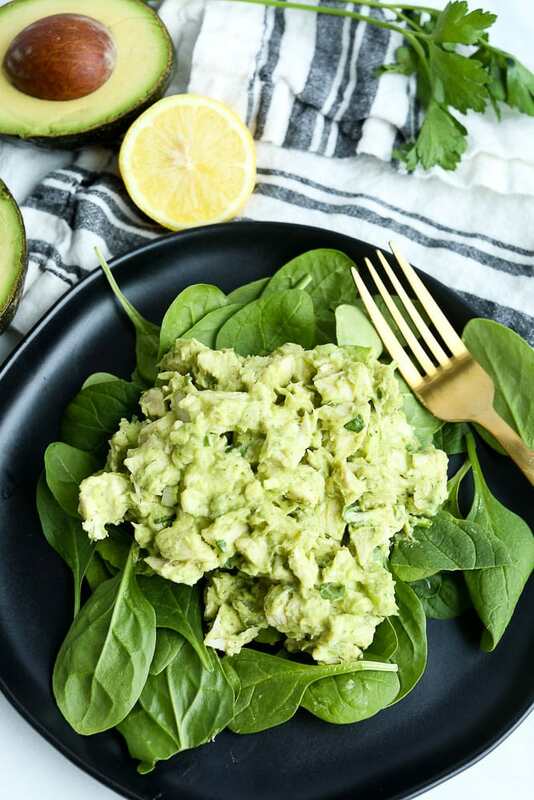 You might also love this Avocado Chicken Salad recipe or Avocado Egg Salad! This recipe was originally published in 2016. A video was added and updates to the post were made in 2019. Links to products are affiliate links. Thank you for always supporting Happy Healthy Mama! I appreciate you. I make this combination all the time – although with a slightly Japanese twist through sesame oil, sesame seeds, and a few drops of soy sauce. The celery and carrot addition sounds great – I’m gonna try this variation next! P.S. I wanted to comment on your wardrobe post, but got a 503 error. Just wanted to let you know something may be wrong with your commenting system. Loved your ideas on simplifying your wardrobe! I need to take yoru advice for sure. Great thoughts and very inspiring. Thanks, for the info Maryea. It should be working now. Great that you loved the ideas on simplifying your wardrobe. Let me know how it goes. Made this and it was fantastic. I added celery too as well as red onion. Thanks for sharing. So glad to hear it, Rach! I like mine with a little more tangy dressing so I use Miracle Whip made with olive oil. It does have some soybean and canola oild in it, though. I saw Veganaise at the grocery store last week….made without soy. Next shopping trip I’m going to try it. I buy Wild Planet Albacore as well and I like the fact that it’s pole caught, not caught with seine nets. I put celery and a tiny bit of chopped sweet gherkins in it. It’s good and has a lot of protein. I am in love with this simple lunch recipe! I make it twice a week, and have changed out the tuna for chicken, and it was just as delicious! Super helpful recipe. I made this for lunch because … avocado & tuna. I liked it exactly as you have it here, and I liked it even more with some fresh chopped onion. Thank you for a new way to enjoy avocado! How long does this keep if you make it ahead of time? I’m guessing the lemon juice will keep the avocado from browning. I try to eat it up within 2 days. Believe it or not, you DO have time to make your own mayonnaise! It takes me longer to describe the process than to do it. If you have an immersion blender and a 2-cup liquid measuring cup, you can do it, too! First, measure out your oil of choice (I use safflower or sunflower) in a separate 1 cup measure (use 1 cup oil). In your 2-cup measure, add 1 egg, 1 Tbsp vinegar (I use cider vinegar), 1 tsp lemon juice, and 1/4 tsp salt. ANYWAY – thank you so much for this recipe! I have been looking for a way to make chicken salad or egg salad that did not use mayo at all (even though I always make my own), & here it is. How long does mayo last making it this way? I would do it if it would last a while, but since we don’t use mayo much, I don’t think that we’d use it up before it goes bad. I’m the only one who likes it in my house. Something I add to tuna is cottage cheese. It’s creamy and helps the texture without using very much mayo. I will try the avocado too…looks delicious. Also I add some fresh chopped red onion, celery (powder ok too) a bit of Dijon mustard, and A sprinkle of seasoned salt (lawrys) adds great flavor. Great ideas, Annie! Thanks for sharing. I am excited to try your tuna salad idea. Is the addition of lemon juice to help keep the avocado from turning? I am always so hesitant to use avocado unless I will be eating it right away lol. Yes, the lemon juice is there to help with keeping the avocado from turning brown. I feel the same way about avocado. I’ve had good luck with this one still being okay to eat the second day. will lime juice work the same for the avocado as lemon juice……..? Yep that should work fine! Wow, this was delicious! I brought the mayo out cause I thought it would need it but it went right back in the fridge. I added lime juice instead of lemon, cilantro, and celery salt instead of paprika and dill. It was fantastic, served on a bed of greens. Can’t wait to make this again for a healthy dinner, thanks for sharing your recipe! I’m creating a list of healthy and quick recipes I can use to start sorting out my candida, and this looks easy and fun. Great! I wish you the best on your health journey. I am soooo happy to find this! I don’t like mayonnaise, so always ate my tuna sandwich with just butter. I can’t wait to try this! Recipe tastes good but doesn’t “work” as suggested. Following the recipe I just got a dry, crumbly mess. I needed to add mayo to make the recipe moist enough to be edible. Your avocado may have been not ripe enough and/or too small. I have made this countless times, and it never turns out the way you described, so something must have been off in your preparation. Hi! Can’t wait to try this but I was just wondering if this recipe is a single serving size or is the portion for 2? Thanks! I just want to thank you so much for this recipe! I’m in the total groove of cleaning my house today, and I started to get hungry. I popped open a can of tuna to realize that my mayonnaise expired just about 2 weeks ago (oops, haha)! I searched up “no mayo tuna” and this page came up saving my tuna. Thank you! How can I get more of your recipes? I don’t have facebook but I see you have so many healthy choices! I’d really appreciate if you could let me know where to find more! This seafood salad looks like the perfect meal for entertainment time. Love the use of the product too. Although thanks for sharing great recipe. Thank you for the feedback, Laura! Great recipe for a healthy fat substitute. I did make some changes to the recipe to suit my taste. I added a few pieces spring onions, about a tablespoon of diced sweet onions and Mrs. dash original. Your recipe states serving size is about 2, is that 2oz? On the can of tuna serving size is about 1/4 cup /2oz. I haven’t actually weighed the servings, so I can’t say for sure. Glad you liked this! I want to print this recipe but when I click your print button it wants to print three pages because of all the advertisements included. Is it possible to print this without all of the advertisements on your webpage trying to be included in the print out? I’m so sorry that’s happening to you, Sheri. I am forwarding this to my ad network and hope they will be able to take care of that for me.